Along with this I threw some frozen green beans in the micro, with some butter, garlic and red pepper, and I had a can of diet pop with this. I prepared these chicken pieces with olive oil, and generous amounts of garlic powder, red pepper, black pepper and coarse salt. If I have oregano, I will use that. Cook for about an hour at 350 degrees, give or take. I really judge it by the look of the chicken. This is pretty easy and tasty and the leftovers will make several more meals. If you live alone, this is a pretty painless way to do this. If I weren't avoiding carbs (mostly unsuccessfully of late), I could have put some rice in the pan below with a little chicken broth; with the drippings on top of it, that would have been out of this world. If you like other flavors, like Cajun or Chinese or Jamaican, Indian or barbeque, that would work just as well. I LOVE your cooking posts, Father, and sure have missed seeing them! However I know how busy you are and am continually amazed by all you do. Yes! This is brilliant. 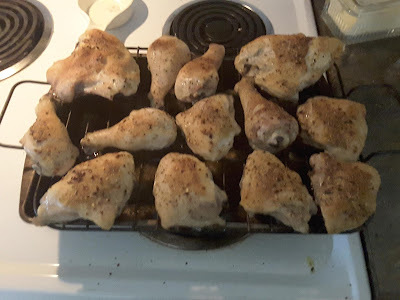 We used to do this on Sunday afternoon when all the children were still home and cook a huge amount of chicken, different spices, as you say, and bag and refrigerate for the rest of the week. I usually grill it, but pan roasting on a bed of aromatics and root veges makes a 'sauce' that also helps rehabilitate the left overs as they become less 'distinct' later in the week. And don't forget the bones of the carcass! Bag and freeze, Later that week and a trip through the pressure cooker and you have a base for stews and soups. How can priests become so depraved?